We believe every pipeline project demands safety, integrity, and skillful management of cost, schedule, and quality! 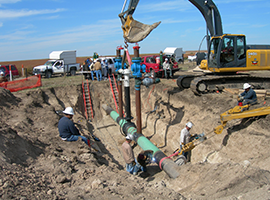 CECO Pipeline Services is a respected pipeline contractor capable of construction projects both large and small. We have experience in all phases of pipeline construction regardless of the size of the project. At CECO Pipeline the expectation is to provide safety, quality, and integrity as part of all our solutions to your needs. We have many years of combined experience from people with proven reliability and performance to make sure your projects are executed by an industry leader. Main line construction up to 48"
Take up and relay up to 48"
Have questions? Contact our Division Manager today!